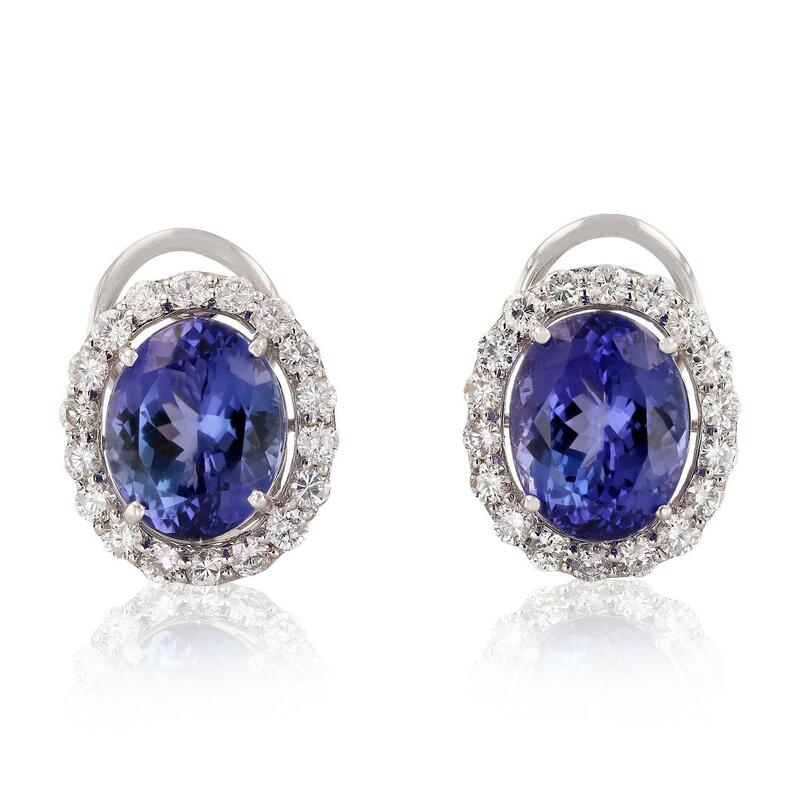 One pair electronically tested 14KT white gold ladies cast & assembled tanzanite & diamond earrings with omega backs. Condition is new, good workmanship. Each earring features a tanzanite set within a diamond bezel supported by an elaborate lattice under gallery. Bright polish finish. Trademark is Orianne. Identified with markings of "14K". Two prong set oval mixed cut natural tanzanites, measuring 11.10 x 9.00 x 6.00mm, exact total weight 9.15ct., clarity is eye clean, type I, medium, very slightly grayish, bluish violet color, (GIA bV 5/3), cut is good. Transmitting light with no distortion, transparent. Measurements & the color grade are an average for the pair. Graded in the setting. Thirty-six prong set round brilliant cut diamonds, measuring 2.00 - 2.00 x 1.20mm (depth est.) exact total weight 36 Stones = 1.29ct. Graded in the setting. Total Weight of Colored Stones 9.15ct. Total Weight of Diamonds 1.29ct.